Its back to where the season started back in August as we visit Tannadice to take on Dundee United this Saturday. The last time the two sides met, at Palmerston, at the beginning of November United were sitting in second place, three points behind leaders Hibs. Not much has changed since and Ray McKinnons side still sit second, behind Hibs, but the gap has increased to four points. United come into this game on the back of two defeats. They were comprehensively beaten by Hibs last Friday night after losing 1-0 at Dumbarton the week before. McKinnon has made just one signing, so far, in this transfer window bringing Danish striker Thomas Mikkelsen in on loan from Odense Boldklub. Away fans at Tannadice are housed in the West Stand. Entry to the West Stand is from Tannadice Street, except for wheelchair and disabled supporters who can enter from Sandeman Road. Please note, you must advise the club in advance if you wish to enter from Sandeman Road. Full details can be found here. "We were all delighted to pick up a win at St Mirren last weekend, as it gets the monkey off our back. I'm obviously pleased to get my first win since taking charge of the club, but I'm more pleased for the players and the fans who have had to endure the miserable run that we'd been on prior to it. It was a great result, a good away performance and hopefully a result that lets us kick on and climb the table. It was important for us that by the time we left Paisley last Saturday, St Mirren hadn't closed the gap on us, so for us to come away from there having extended our advantage over them is great. It would be good if we can build on the result and find some consistency that allows us to go on a run. The players deserved a result for the hard work that they've been putting in, so it's good to put it to bed and we can now move on. The next three or four games will probably decide how our season is going to go, but the fact that no one other than Hibernian, Dundee United and possibly Morton have consistently picked up positive results gives us an idea of how tight the league is and that's probably a reason why we haven't found ourselves in a worse position. The players who came in last week were excellent and complimented the players we already have at the club, we're starting to get into a position where we have competition for places which is a huge thing for me. Although we've been hit by illness over the last week to ten days the boys have again put in a high standard of training this week. As well as a tough training schedule, we've fitted in a competitive game against a strong Celtic U20 side, it was a well worth exercise, a really good workout for the boys. This week we face Dundee United. I think these are the games that everyone looks forward to, we all look forward to going to places like Tannadice. It will be a tough afternoon for us, I watched them in person against Hibernian last Friday, but I don't think that game was a true reflection of the way United play. Hibs were outstanding and hit them like a whirlwind but what I could tell from the game was that United have players who are technically good, they have players who are good on the ball. Every game in this league is tough so we need to make sure that we are switched on and don't take our eye off the ball. United have lost their last two, so will be down on confidence, where as last week's result means we can go into the game more upbeat, however, we can't be relaxed. We will go there to get a positive result and hopefully build on what we've achieved over the past few weeks." Jamie Hamill's suspension hasn't kicked in yet, so he will still be available for the game. However, a few players have been struggling with illness, so we will have to wait and see how they are before finalizing the squad. Mr Muir is a referee we know well, this will be his 22nd game in charge for us going back 10 years, although this will be his first league game this season. The only game hes taken charge of this season was the 2-1 defeat to Partick in the Betfred Cup. Our record in those 21 games is fairly average with only 9 wins, 4 draws and 8 defeats. Those defeats includes the game in 2011 when, 10 men, Dunfermline ran out 6-1 winners. 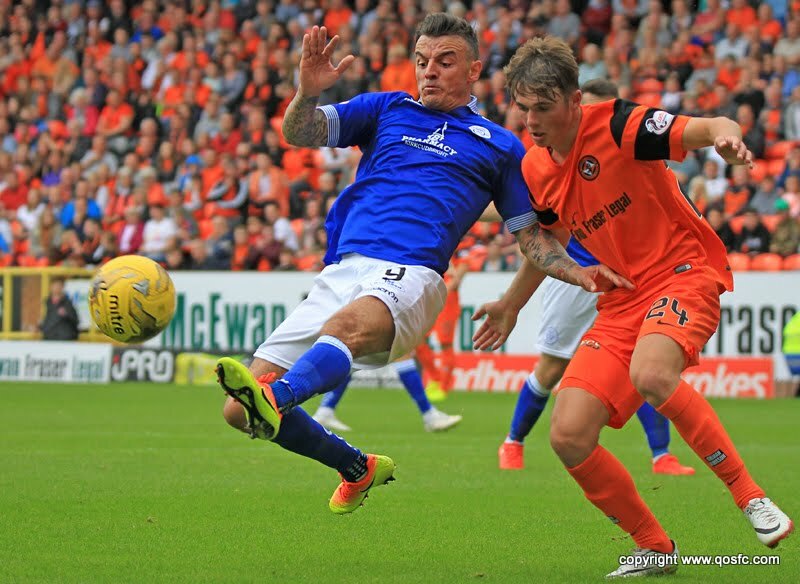 There have been only 9 games between the two sides at Tannadice and the home side has a clear advantage with 6 wins to 2 and just one draw, which came in the opening game of this season. That game, though, was our only visit to Tannadice this century, the previous match a 6-0 defeat in the League Cup in 1992.